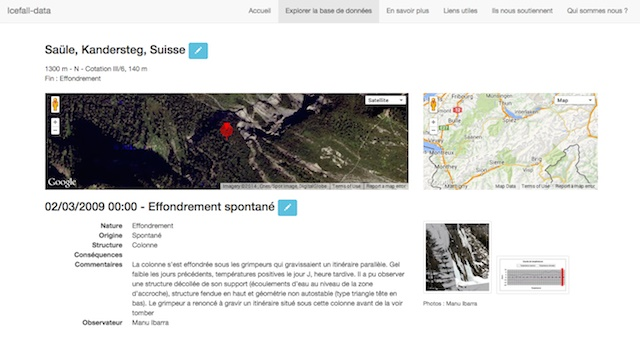 This website (both english and french) will provide a massive database available for a large public of climbers, enthousiast or professional, who want to learn more about icefalls and their evolution. Interface will offer a precise 'Google Earth' localization of the structures, weather data (temperature curves, snowfalls, etc), circumstances, local infos, photos, videos and comments. 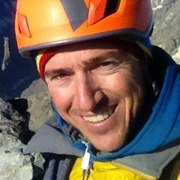 The ambition of this collaborating tool is to become a think-tank and a source of scientific and technical infos for all the ice-climbing community. We want to share and enhance knowledges on ice and dangers of ice-climbing as it becomes a popular activity. Our budget is employed to develop a website and specific applications. - The second step is to make the data viewing easy, with GoogleEarth tool and links to weather infos. One of our challenge is to find and use reliable weather data, all around the world. A first protoype has just been developped to test and valid the data model, and to work on the best User Experience which could be offered by the App. Our research on weather data and our links to many climber's communities provided us a large amount of infos that we'll share in the next monthes. Two third of our total budget (5500 €) has been already invested for this. So, we need now to earn it and to get 2000 euros more to complete the mission ! Our sincere gratitude + your name on "they support us" page + a sticker "icefall-data"